Human Develop Plan Organisation (H.D.P.O.) one day workshop at Fatehpur Block in Gaya district Bihar state. Chief guest was M.L.A. Sham Dev Paswan. According to the society Plantation is need of time assistance of preservation of environment and doing plantation work. 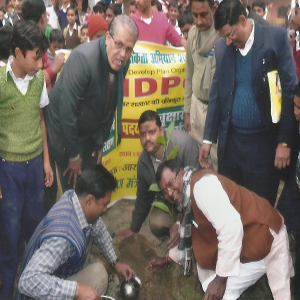 Society also organized a free distribution of nursery plant camp at area in Gaya district and distributed nutritional plants between the people. A training programme organizes through the society for farmer. In this training trained to farmer for use new technique of agriculture work. To stop illegal plant cutting and balancing environment our society started environment awareness programme. Under plantation programme our society working trees re-plantation for minimize bad effect due to pollution. With support of district plantation board our society stated free plant distribution of different kinds of plants. Our society also focused and working for to control sound pollution and water pollution.